Posted November 9, 2015 by Maloney & filed under Blog Post. Chocolate Classes & Chocolate Making Workshops seem to be the very on trend right now. Jam Inns have been entertaining Hen Parties with Cocktail Classes for years but the Chocolate Classes we launched back in 2012 have this year seen there biggest rise yet. We cater for around 10,000 girls a year on Hen Parties so we have a good understanding of the difficulties groups can face when choosing activities for all the age groups to participate in & very importantly enjoy. Chocolate Classes are great fun & we bring along all the ingredience needed for the day including table coverings to make from scratch hand made Belgium Truffles. 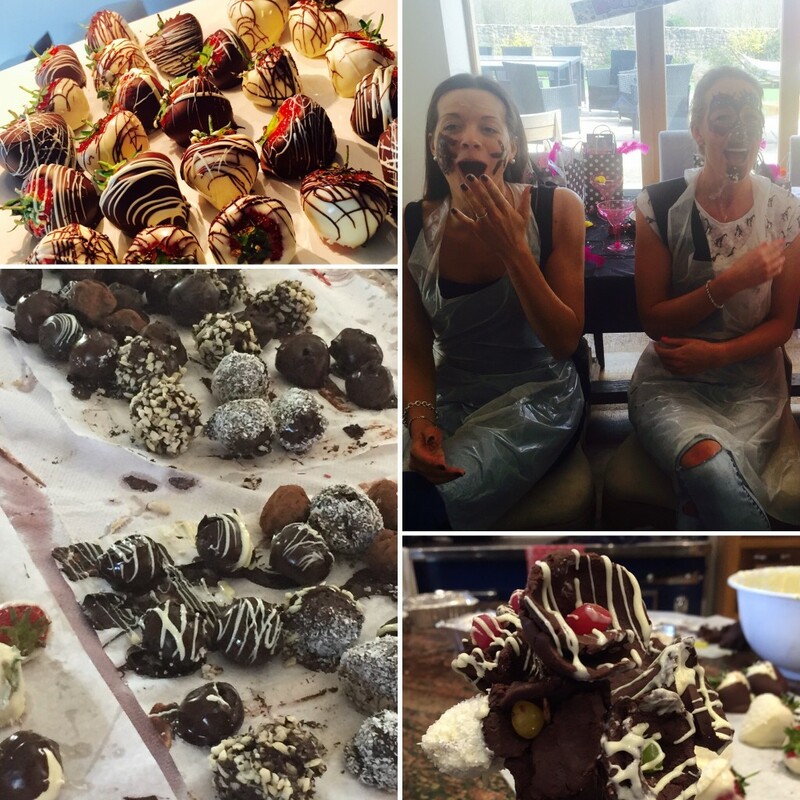 Guests also try there skills at Chocolate strawberry decorating & a number of chocolate challenges during our classes. The classes last approx 1.5hrs & they are typically booked on Saturday or Sunday mornings or Saturday or Sunday early afternoon at rental accommodation like apartments, cottages, townhouses & farm houses in & around Bath, Bristol, Cheltenham, Gloucester & Cardiff. We are based in Bristol & cater mobile at our customers venues anywhere within a 50 mile radius of Bristol. If your outside of this area then we accommodate cocktail classes nationally anywhere in England & Wales. Our chocolate classes are priced at £34.95pp for a chocolate workshop with a minimum of 10 guests. We then charge a very small travel fee dependant on the exactly location. If you fancy dipping your hands in melted chocolate & creating from scratch some amazing chocolate truffles then take a browses on our website. Pop to the quote page & you can get quotes & make bookings simply & easily through our instant automated booking system. Please note that due to catering for a very large number of Hen Parties weekends always book out really early so don't wait, you can book with a £99 deposit & then the final balance won't be due until 4 weeks prior to the class. Take a look online today to find our more about our chocolate classes for hen parties.